Information & Picture found in the SLC Memorabilia Collection. Article published in the "Shipmate", June 1983 magazine. VAdm. George Frederick Hussey, Jr., USN (Ret.) died on April 17th, 1983 in Laguna Hills, CA. Memorial services were held on April 21st in the St. Margaret of Scotland Episcopal Church in San Juan Capistrano. Appointed to the Naval Academy from the State of Mass., he was editor of the "Lucky Bag" as a midshipman and stood seventh in his Class. Upon graduation in June of 1916 he joined PENNSYLVANIA as that battleship operated with the Atlantic Fleet during WWI and served on board until 1920, later attending postgraduate school at Annapolis and continuing his studies at the Univ. of Chicago where he majored in ballistics. head of the armor and projectile section. Returning to sea, he served in WEST VIRGINIA and CALIFORNIA as aide to Commander, Battleship Division, Battle Fleet, then assisted in fitting out SALT LAKE CITY with the first eight-inch guns carried by a Navy cruiser and served on board as "Gunnery Officer." Duty followed at Dahlgren, VA. then command of ZANE and DECATUR before having another tour at the Bureau of Ordnance. Pacific duty followed in command of destroyer divisions, then Mine Squadron Three in HOPKINS and directing the off-shore patrol off Pearl harbor after Dec. 10, 1941. In 1942 he returned to Washington as director of production in the Bureau of Ordnance and became chief of the bureau in 1943, remaining at his post until his transfer to the retired list in 1947 and directing development and production of arms during WWII. Among the weapons introduced under his command were the Mark 5 torpedo and a self-guided missile known as "The Bat" which was used against both land and sea targets. While on active duty, he was awarded the Distinguished Service Medal and he was made an honorary commander of the Order of the British Empire. 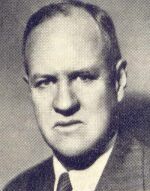 From 1948 to 1961, Admiral Hussey was managing director and secretary of the American Standards Assoc., now the American National Standards Institute, in New York City. He was a life member of the Naval Academy Alumni Assoc., and had been national president from 1953-1955. He was survived by his widow, Phebe, a son and five grandchildren.